In the last article we had a look at the depth of the “mixed ocean layer” (MLD) and its implications for the successful measurement of climate sensitivity (assuming such a parameter exists as a constant). Because heat slowly penetrates deeper into the ocean, an appropriate depth for heat capacity depends on the length of the period over which Eq. (1) is being applied (Watterson 2000; Held et al. 2010). For 80-yr global climate model runs, Gregory (2000) derived an optimum mixed layer depth of 150 m. Watterson (2000) found an initial global heat capacity equivalent to a mixed layer of 200 m and larger values for longer simulations. This seems like it might make sense – if we wanted to keep a “zero dimensional model”. But it’s questionable whether the model retains any value with this “fudge”. So because heat actually moves from the mixed layer into the deeper ocean (rather than the mixed layer increasing in depth) I instead enhanced the model to create a heat flux from the MLD through a number of ocean layers with a parameter called the vertical eddy diffusivity to determine this heat flux. So the model is now a 1D model with a parameterized approach to ocean convection. The concept here is the analogy of conductivity but when convection is instead the primary mover of heat. What it says in almost plain English is that the change in temperature with respect to time is equal to the thermal diffusivity times the change in gradient of temperature with depth. Don’t worry if that’s not clear (and there is a explanation of the simple steps required to calculate this in note 1). So, an important bit to understand.. Many researchers have attempted to measure an average value for eddy diffusivity in the ocean (and in lakes). The concept here, an explained in Part Two, is that turbulent motions of the ocean move heat much more effectively than conduction. The value can’t be calculated from first principles because that would mean solving the problem of turbulence, which is one of the toughest problems in physics. Instead it has to be estimated from measurements. There is an inherent problem with eddy diffusivity for vertical heat transfer that we will come back to shortly. There is also a minor problem of notation that is “solved” here by changing the notation. Usually conductivity is written as “k”. However, most papers on eddy diffusivity write diffusivity as “k”, sometimes “K”, sometimes “κ” (Greek ‘kappa’) – creating potential confusion so I revert back to “α”. And to make it clear that it is the convective value rather than the conductive value, I use αeddy. And for the equivalent parameter to conductivity, keddy. α is an apparent global eddy diffusion coefficient which helps to reproduce an average transport phenomenon consisting of a series of distinct and overlapping mechanisms. Oeschger and his co-workers studied the problem via the diffusion into the ocean of 14C from nuclear weapons testing. The range they calculated for αeddy = 1 x 10-4 – 1.8 x 10-4 m²/s. This equates to keddy = 420 – 760 W/m.K, and by comparison, the conductivity of still water, k = 0.6 W/m.K – making convection around 1,000 times more effective at moving heat vertically through the ocean. We do not mean to imply that the process of vertical eddy mixing actually occurs within the body of the main oceanic thermocline. Indeed, the values we require are an order of magnitude greater than those permitted by conventional oceanographic wisdom (see Garrett, 1979, for summary). The vertical eddy coefficients used here should rather be thought of as parameters that take into account all the processes that transfer tracers across density horizons. In addition to vertical mixing by eddies, these include mixing induced by sediment friction at the ocean margins and mixing along the surface in the regions where density horizons outcrop. Anyone familiar with the water mass structure and ventilation dynamics of the ocean will quickly realize that the box-diffusion model is by no means a realistic representation. No simple modification to the model will substantially improve the situation. To do so we must take a giant step in complexity to a new generation of models that attempt to account for the actual geometry of ventilation of the sea. We are as yet not in a position to do this in a serious way. At least a decade will pass before a realistic ocean model can be developed. We will use these values from Broecker to see what happens to the measurement problems of climate sensitivity when used in my simple model. 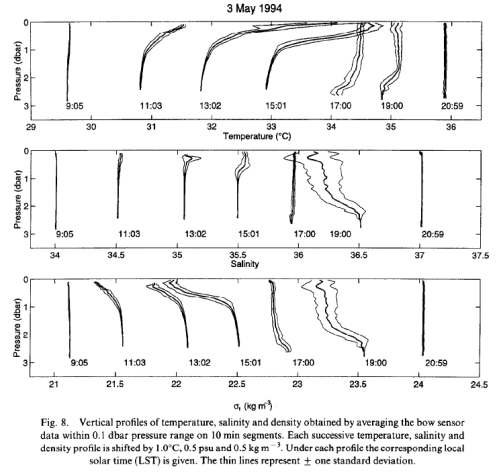 These two papers were cited by Hansen et al in their 1985 paper with the values for vertical eddy diffusivity used to develop the value of the “effective mixed depth” of the ocean. In reviewing these papers and searching for more recent work in the field, I tapped into a rich vein of research that will be the subject of another day. 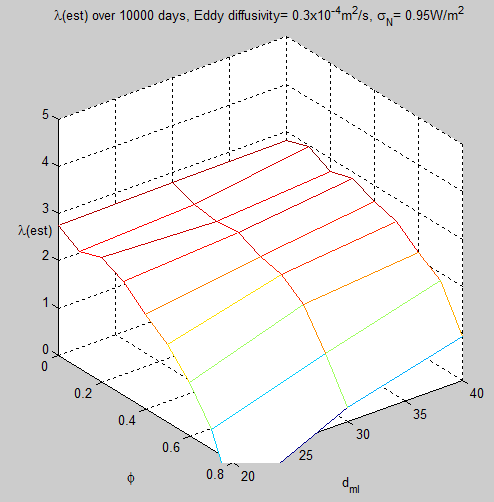 The diapycnal eddy diffusivity K estimated for the first 6 months was 0.12 ± 0.02 x10-4 m²/s, while for the subsequent 24 months it was 0.17 ± 0.02 x10-4 m²/s. The circulation of the ocean is severely constrained by density stratification. A water parcel cannot move from one surface of constant potential density to another without changing its salinity or its potential temperature. There are virtually no sources of heat outside the sunlit zone and away from the bottom where heat diffuses from the lithosphere, except for the interesting hydrothermal vents in special regions. The sources of salinity changes are similarly confined to the boundaries of the ocean. If water in the interior is to change potential density at all, it must be by mixing across density surfaces (diapycnal mixing) or by stirring and mixing of water of different potential temperature and salinity along isopycnal surfaces (isopycnal mixing). Most inferences of dispersion parameters have been made from observations of the large-scale fields or from measurements of dissipation rates at very small scales. Unambiguously direct measurements of the mixing have been rare. Because of the stratification of the ocean, isopycnal mixing involves very different processes than diapycnal mixing, extending to much greater length scales. A direct approach to the study of both isopycnal and diapycnal mixing is to release a tracer and measure its subsequent dispersal. Such an experiment, lasting 30 months and involving more than 105 km² of ocean, is the subject of this paper. For example, the Community Climate Simulation Model (CCSM) ocean component model uses a form similar to Eq. (1), but with an upper-ocean value of 0.1 x 10-4 m²/s and a deep-ocean value of 1.0 x 10-4 m²/s, with the transition depth at 1000 m.
However, there is no observational evidence to suggest that the mixing in the ocean is horizontally uniform, and indeed there is significant evidence that it is heterogeneous with spatial variations of several orders of magnitude in its intensity (Polzin et al. 1997; Ganachaud 2003). More on eddy diffusivity measurements in another article – the parameter has a significant impact on modeling of the ocean in GCMs and there is a lot of current research into this subject. Two naturally occurring isotopes can be applied to the determination of the rate of vertical turbulent mixing in the deep sea: 222Rn (half-life 3.824 days) and 228Ra (half-life 5.75 years). In this paper we discuss the results from fourteen 222Rn and two 228Ra profiles obtained as part of the GEOSECS program. From these results we conclude that the most important factor influencing the vertical eddy diffusivity is the buoyancy gradient [(g/p)(∂ρpot/∂z)]. The vertical diffusivity shows an inverse proportionality to the buoyancy gradient. Their paper is very much about the measurements and calculations of the deeper ocean, but is relevant for anywhere in the ocean, and helps explain why the different values for different regions were obtained by Broecker that we saw earlier. (Prof. Wallace S. Broecker was a co-author on this paper as well, and has authored/co-authored 100’s of papers on the ocean). What is the buoyancy gradient and why does it matter? Cold fluids sink and hot fluids rise. This is because cold substances contract and so are more dense. So in general, in the ocean, the colder water is below and the warmer water above. Probably everyone knows this. The buoyancy gradient is a measure of how strong this effect is. The change in density with depth determines how resistant the ocean is to being overturned. If the ocean was totally stable no heat would ever penetrate below the mixed layer. But it does. And if the ocean was totally stable then the measurements of 14C from nuclear testing would be zero below the mixed layer. But it is not surprising that the more stable the ocean is due to the buoyancy gradient the less heat diffuses down by turbulent motion. And this is why the estimates by Broecker shown earlier have a much lower value of diffusivity for the tropics than for the poles. In general the poles are where deep convection takes place – lots of cold water sinks, mixing the ocean – and the tropics are where much weaker upwelling takes place – because the ocean surface is strongly heated. This is part of the large scale motion of the ocean, known as the thermohaline circulation. More on this another day. Now water is largely incompressible which means that the density gradient is only determined by temperature and salinity. 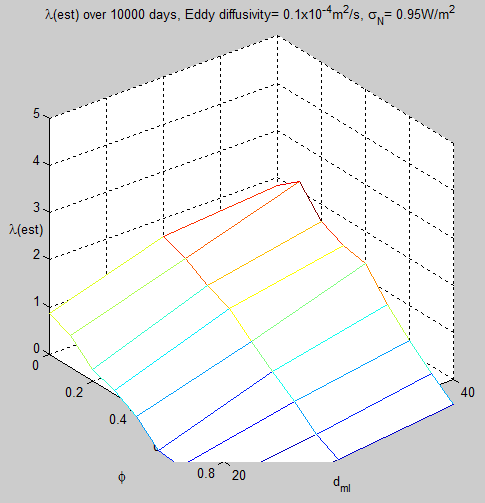 This creates the problem that eddy diffusivity is a value which is not only parameterized, but also dependent on the vertical temperature difference in the ocean. 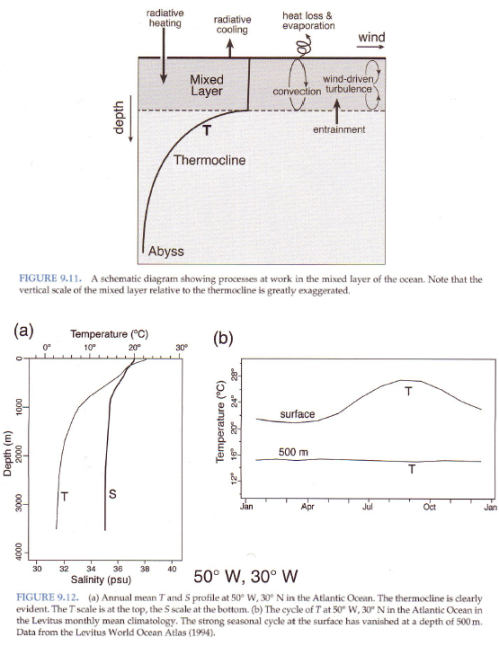 Heat flow also depends on temperature difference, but with the opposite relationship. This is not something to untangle today. 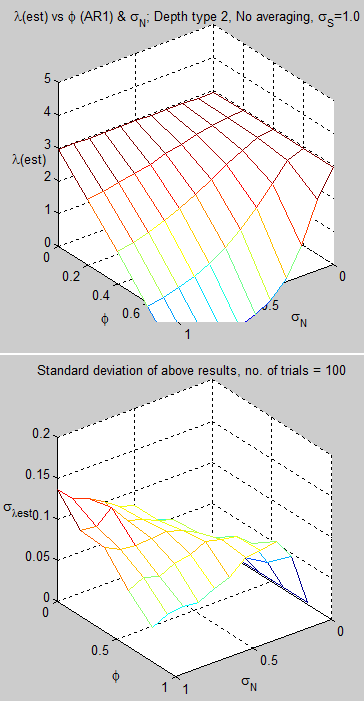 Today we will just see what happens to our simple model when we use the best estimates of vertical eddy diffusivity. For the parameter N, SB08 use a random daily shortwave flux scaled so that the standard deviation of monthly averages of outgoing radiation (N – λT) is 1.3 W/m². They base this on the standard deviation of CERES shortwave data between March 2000 and December 2005 for the oceans between 20 °Nand 20 °S. We have analyzed the same dataset and find that, after the seasonal cycle and slow changes in forcing are removed, the standard deviation of monthly means of the shortwave radiation is 1.24 W/m², close to the 1.3 W/m² specified by SB08. However, longwave (infrared) radiation changes the energy budget just as effectively from the earth as shortwave radiation (reflected sunlight). Cloud systems that might induce random fluctuations in reflected sunlight also change outgoing longwave radiation. In addition, the feedback parameter λ is due to both longwave and shortwave radiation. Modeled total outgoing radiation should therefore be compared with the observed sum of longwave and shortwave outgoing radiation, not just the shortwave component. The standard deviation of the sum of longwave and shortwave radiation in the same CERES dataset is 0.94 W/m². Even this is an upper limit, since imperfect spatial sampling and instrument noise contribute to the standard deviation. [Note I change their α (climate feedback) to λ for consistency with previous articles]. We therefore use 0.94 W/m² as an upper limit to the standard deviation of outgoing radiation over the tropical oceans. For comparison, the standard deviation of the global CERES outgoing radiation is about 0.55 W/m². All of these points seem valid (however, I am still in the process of examining CERES data, and can’t comment on their actual values of standard deviation. Apart from the minor challenge of extracting the data from the netCDF format there is a lot to examine. A lot of data and a lot of issues surrounding data quality). However, it raised an interesting idea about non-linearity. Readers who remember on Part One will know that as radiative noise increases and ocean MLD decreases the measurement problem gets worse. And as the radiative noise decreases and ocean MLD increases the measurement problem goes away. If we average global radiative noise and global MLD, plug these values into a zero-dimensional model and get minimal measurement problem what does this mean? Due to non-linearity, it tells us nothing. I tested this with a simple model – created two regions, one 10% of the surface area, the other 90%. In the larger region the MLD was 200m and the radiative noise was zero; and in the smaller region the MLD was 20m and the (standard deviation of) radiative noise was varied from 0 – 2. The temperature and radiative flux were converted into an area weighted time series and the regression produced large deviations from the real value of λ. A similar run on a global model with an MLD of 180m and radiative noise of 0-0.2 shows an accurate assessment of λ. This is to be expected of course. So with this in mind I tested the new 1D model with different values of ocean depth eddy diffusivity, radiative noise, and an AR(1) model for the radiative noise. I used values for the tropical region as this is clearly the area most likely to upset the measurement – shallow MLD, higher radiative noise and weaker eddy diffusivity. As best as I could determine from de Boyer Montegut’s paper, the average MLD for the 20°N – 20°S region is approximately 30m. For reference, as it’s hard to read off the graph, the value at 30m and φ=0.5 is λest = 2.3. Note that these values are only for one region, not for the whole globe. Another important point is that I have used the radiative noise value as the standard deviation of daily radiative noise. I have started to dig into CERES data to see whether such a value can be calculated, and also what typical value of autoregressive parameter should be used (and what kind of ARMA model), but this might take some time. Yet smaller values of eddy diffusivity are possible for smaller regions, according to Jochum (2009). This would likely cause the problems of estimating climate sensitivity to become worse. Although highly simplified, a single box model of the earth has some pedagogic value. One must remember that the heat capacity c and feedback parameter λ are not really constants, since heat penetrates more deeply into the ocean on long time scales and there are fast and slow climate feedbacks (Knutti et al. 2008). It is tempting to add a few more boxes to account for land, ocean, different latitudes, and so forth. Adding more boxes to an energy balancemodel can be problematic because one must ensure that the boxes are connected in a physically consistent way. A good option is to instead consider a global climate model that has many boxes connected in a physically consistent manner. The point being that no one believes a slab model of the ocean to be a model that gives really useful results. Spencer & Braswell likewise don’t believe that the slab model is in any way an accurate model of the climate. Or at least, it appears easy to show that slightly different enhancements of the simple model demonstrate continued problems in measuring climate sensitivity – due to the impact of radiative noise in the climate system. I have produced a simple model and apparently demonstrated continued climate sensitivity measurement problems. This is in contrast to Murphy & Forster who took a different approach and found that the problem went away. 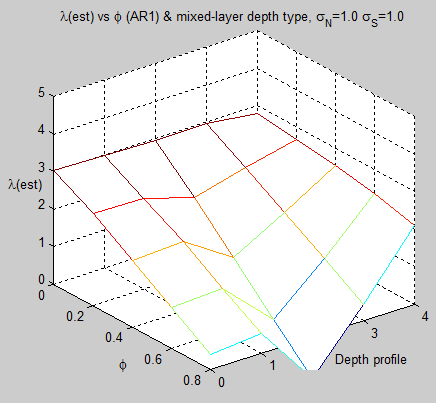 However, my model has a more realistic approach to moving heat from the mixed layer into the ocean depths than theirs. My model does have the drawback that the massive army of Science of Doom model testers and quality control champions are all away on their Xmas break. So the model might be incorrectly coded. It’s also likely that someone else can come along and take a slightly enhanced version of this model and make the problem vanish. I have used values for MLD and eddy diffusivity that seem to represent real-world values but I have no idea as to the correct values for standard deviation and auto-correlation of daily radiative noise (or appropriate ARMA model). These values have a big impact on the climate sensitivity measurement problem for reasons explained in Part One. A useful approach to determining the effect of radiative noise on climate sensitivity measurement might be to use a coupled atmosphere-ocean GCM with a known climate sensitivity and an innovative way of removing radiative noise. These kind of experiments are done all the time to isolate one effect or one parameter. Perhaps someone has already done this specific test? I see other potential problems in measuring climate sensitivity. Here is one obvious problem – as the temperature of the mixed layer increases with continued increases in radiative forcing the buoyancy gradient increases and the eddy diffusivity reduces. We can calculate radiative forcing due to “greenhouse” gases quite accurately and therefore remove it from the regression analysis (see Spencer & Braswell 2008 for more on this). But we can’t calculate the change in eddy diffusivity and heat loss to the deeper ocean. This adds another “correlated” term that seems impossible to disentangle from the climate sensitivity calculation. An alternative way of looking at this is that climate sensitivity might not be a constant – as already noted in Part One. due to the fact that α can be a function of z (and definitely is in the case of the ocean). Although this looks tricky – and it is tricky to find analytical solutions – solving the 1D version numerically is very straightforward and anyone can do it. Note 2: I am in the process of examining CERES data. Apart from the challenge of extracting the data from the netCDF format there is a lot to examine. A lot of data and a lot of issues surrounding data quality. In Measuring Climate Sensitivity – Part One we saw that there can be potential problems in attempting to measure the parameter called “climate sensitivity”. Using a simple model Spencer & Braswell (2008) had demonstrated that even when the value of “climate sensitivity” is constant and known, measurement of it can be obscured for a number of reasons. 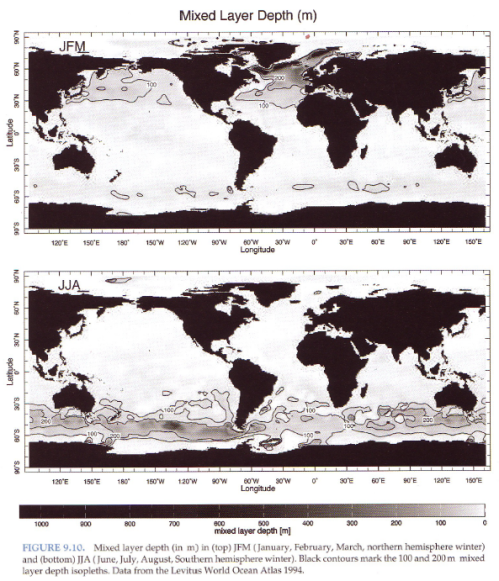 The simple model was a “slab model” of the ocean with a top of atmosphere imbalance in radiation. Murphy & Forster (2010) criticized Spencer & Braswell for a few reasons including the value chosen for the depth of this ocean mixed layer. As the mixed layer depth increases the climate sensitivity measurement problems are greatly reduced. First, we will consider the mixed layer in the context of that simple model. Then we will consider what it means in real life. 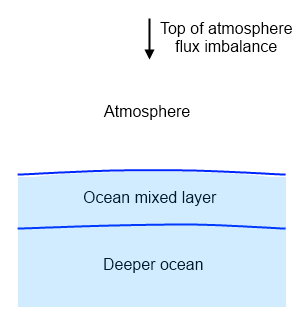 The simple model used by Spencer & Braswell has a “mixed ocean layer” of depth 50m. In the model the mixed layer is where all of the imbalance in top of atmosphere radiation gets absorbed. The idea in the simple model is that the energy absorbed from the top of atmosphere gets mixed into the top layer of the ocean very quickly. In reality, as we will see, there isn’t such a thing as one layer but it is a handy approximation. For the heat capacity parameter c, SB08 use the heat capacity of a 50-m ocean mixed layer. This is too shallow to be realistic. Because heat slowly penetrates deeper into the ocean, an appropriate depth for heat capacity depends on the length of the period over which Eq. (1) is being applied (Watterson 2000; Held et al. 2010). For 80-yr global climate model runs, Gregory (2000) derived an optimum mixed layer depth of 150 m. Watterson (2000) found an initial global heat capacity equivalent to a mixed layer of 200 m and larger values for longer simulations. Held et al. (2010) found an initial time constant τ = c/α of about four yr in the Geophysical Fluid Dynamics Laboratory global climate model. Schwartz (2007) used historical data to estimate a globally averaged mixed layer depth of 150 m, or 106 m if the earth were only ocean. The idea is an attempt to keep the simplicity of one mixed layer for the model, but increase the depth of this mixed layer for longer time periods. There is always a point where models – simplified versions of the real world – start to break down. This might be the case here. The initial model was of a mixed layer of ocean, all at the same temperature because the layer is well-mixed – and with some random movement of heat between this mixed layer and the ocean depths. In a more realistic scenario, more heat flows into the deeper ocean as the length of time increases. What Murphy & Forster are proposing is to keep the simple model and “account” for the ever increasing heat flow into the deeper ocean by using a depth of the mixed layer that is dependent on the time period. If we do this perhaps the model will work, perhaps it won’t. By “work” we mean provide results that tell us something useful about the real world. So I thought I would introduce some more realism (complexity) into the model and see what happened. This involves a bit of a journey. Water is a very bad conductor of heat – as are plastic and other insulators. Good conductors of heat include metals. However, in the ocean and the atmosphere conduction is not the primary heat transfer mechanism. It isn’t even significant. Instead, in the ocean it is convection – the bulk movement of fluids – that moves heat. Think of it like this – if you move a “parcel” of water, the heat in that parcel moves with it. Once the sun sets the ocean surface cools rapidly via radiation and convection to the atmosphere. The result is colder water, which is heavier. Heavier water sinks, so the ocean gets mixed. This same effect takes place on a larger scale for seasonal changes in temperature. And the top of the ocean is also well mixed due to being stirred by the wind. A striking and nearly universal feature of the open ocean is the surface mixed layer within which salinity, temperature, and density are almost vertically uniform. This oceanic mixed layer is the manifestation of the vigorous turbulent mixing processes which are active in the upper ocean. There’s more on this subject in Does Back-Radiation “Heat” the Ocean? – Part Three. How Deep is the Ocean Mixed Layer? This is not a simple question. Partly it is a measurement problem, and partly there isn’t a sharp demarcation between the ocean mixed layer and the deeper ocean. Various researchers have made an effort to map it out. You can see that the deeper mixed layers occur in the higher latitudes. 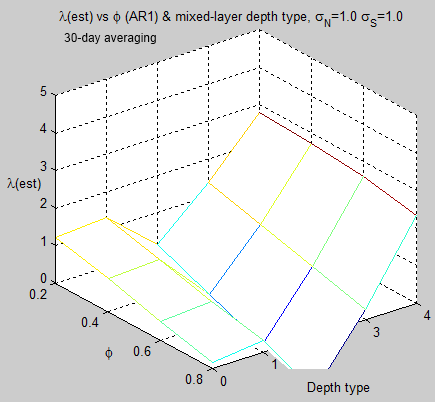 The main temporal variabilities of the MLD [mixed layer depth] are directly linked to the many processes occurring in the mixed layer (surface forcing, lateral advection, internal waves, etc), ranging from diurnal [Brainerd and Gregg, 1995] to interannual variability, including seasonal and intraseasonal variability [e.g., Kara et al., 2003a; McCreary et al., 2001]. The spatial variability of the MLD is also very large. The MLD can be less than 20 m in the summer hemisphere, while reaching more than 500 m in the winter hemisphere in subpolar latitudes [Monterey and Levitus, 1997]. Seeing this map definitely had me wondering about the challenge of measuring climate sensitivity. Spencer & Braswell had used 50m MLD to identify some climate sensitivity measurement problems. Murphy & Forster had reproduced their results with a much deeper MLD to demonstrate that the problems went away. But what happens if instead we retest the basic model using the actual MLD which varies significantly by month and by latitude? So instead of “one slab of ocean” at MLD = choose your value, we break up the globe into regions, have different values in each region each month and see what happens to climate sensitivity problems. By the way, I also attempted to calculate the global annual (area weighted) average of MLD from the maps above, by eye. I also emailed the author of the paper to get some measurement details but no response. My estimate of the data in this paper was a global annual area weighted average of 62 meters. 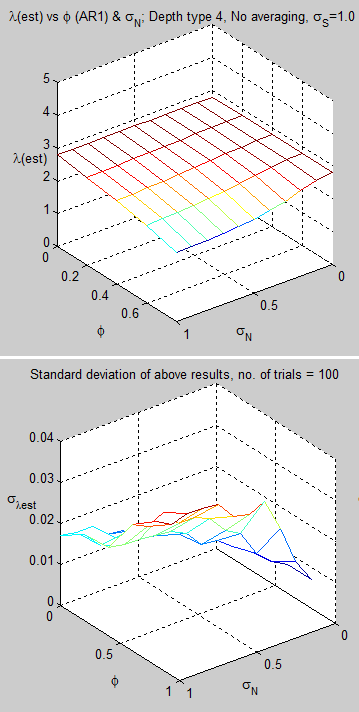 I updated the Matlab program from Measuring Climate Sensitivity – Part One. The globe is now broken up into 30º latitude bands, with the potential for a different value of mixed layer depth for each month of the year. Type 1 – using the values from de Boyer’s paper, as best as can be estimated from looking at the monthly maps. Type 2 – no change each month, with scaling of 60ºN-90ºN = 100x the value for 0ºN – 30ºN, and 30ºN – 60ºN = 10x the value for 0ºN – 30ºN – similarly for the southern hemisphere. 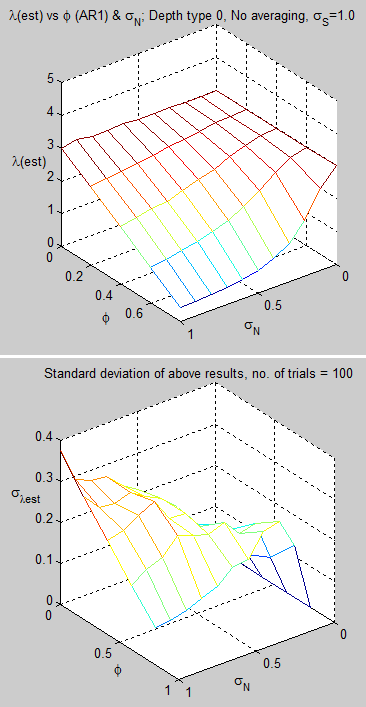 Type 3 – alternating each month between Type 2 and its inverse, i.e., scaling of 0ºN – 30ºN = 100x the value for 60ºN-90ºN and 30ºN – 60ºN = 10x the value for 60ºN-90ºN. Type 4 – no variation by latitude, but month 1 = 1000x month 4, month 2 = 100x month 4, month 3 = 10x month 4, repeating 3 times per year. In each case the global annual (area weighted) average = 62m. Essentially types 2-4 are aimed at creating extreme situations. What’s the message from these results? In essence, type 0 (the original) and type 1 (using actual MLDs vs latitude and month from de Boyer’s paper) are quite similar – but not exactly the same. However, if we start varying the MLD by latitude and month in a more extreme way the results come out very differently – even though the global average MLD is the same in each case. This demonstrates that the temporal and area variation of MLD can have a significant effect and modeling the ocean as one slab – for the purposes of this enterprise – may be risky. 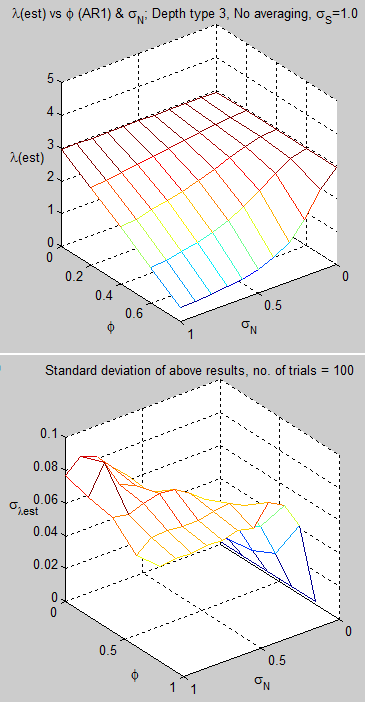 We haven’t considered the effect of non-linearity in these simple models. That is, what about interactions between different regions and months. If we created a yet more complex model where heat flowed between regions dependent on the relative depths of the mixed layers what would we find? Now, in case anyone has lost the plot by this stage – and it’s possible that I have – don’t get confused into thinking that we are evaluating GCM’s and gosh aren’t they simplistic.. No, GCM’s have very sophisticated modeling. What we have been doing is tracing a path that started with a paper by Spencer & Braswell. This paper used a very simple model to show that with some random daily fluctuations in top of atmosphere radiative flux, perhaps due to clouds, the measurement of climate sensitivity doesn’t match the actual climate sensitivity. We can do this in a model – prescribe a value and then test whether we can measure it. This is where this simple model came in. It isn’t a GCM. However, Murphy & Forster came along and said if you use a deeper mixed ocean layer (which they claim is justified) then the measurement of climate sensitivity does more or less match the actual climate sensitivity (they also had comment on the values chosen for radiative flux anomalies, a subject for another day). What struck me was that the test model needs some significant improvement to be able to assess whether or not climate sensitivity can be measured. And this is with the caveat – if climate sensitivity is a constant. As Murphy & Forster have pointed out, the longer the time period, the more heat is “injected” into the deeper ocean from the mixed layer. So a better model would capture this better than just creating a deeper mixed layer for a longer time. 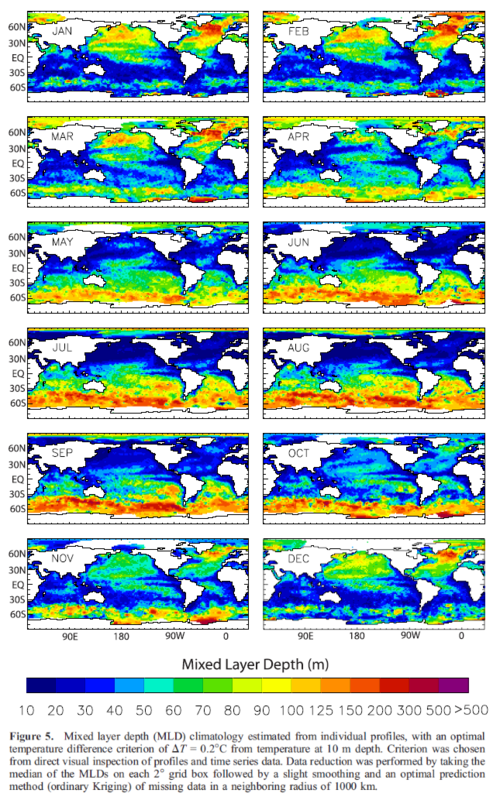 Modeling true global ocean convection is an impossible task. Take a look at Heat Transfer Basics – Part Zero for more on these basics. For water, k = 0.6 W/m².K. So, as an example, if we have a 10ºC temperature difference across 1 km depth of water, q” = 0.006 W/m². This is tiny. Heat flow via conduction is insignificant. Convection is what moves heat in the ocean. Many researchers have measured and estimated vertical heat flow in the ocean to come up with a value for vertical eddy diffusivity. This allows us to make some rough estimates of vertical heat flow via convection. In the next version of the Matlab program (“in press”) the ocean is modeled with different eddy diffusivities below the mixed ocean layer to see what happens to the measurement of climate sensitivity. So far, the model comes up with wildly varying results when the eddy diffusivity is low, i.e., heat cannot easily move into the ocean depths. And it comes up with normal results when the eddy diffusivity is high, i.e., heat moves relatively quickly into the ocean depths. Due to shortness of time, this problem has not yet been resolved. More in due course. Regular readers of this blog understand that navigating to any kind of conclusion takes some time on my part. And that’s when the subject is well understood. I’m finding that the signposts on the journey to measuring climate sensitivity are confusing and hard to read. And that said, this article hasn’t shed any more light on the measurement of climate sensitivity. Instead, we have reviewed more ways in which measurements of it might be wrong. But not conclusively. Next up we will take a detour into eddy diffusivity, hoping in the meantime that the Matlab model problems can be resolved. Finally a more accurate model incorporating eddy diffusivity to model vertical heat flow in the ocean will show us whether or not climate sensitivity can be accurately measured.